In a single night, a tiny, unnamed island of Japan sinks into the ocean and disappears forever. Nearby, long dormant volcanoes erupt again, one by one, And an inspection of the ocean’s floor at a depth of some 10.000 metres discovers signs of strange, almost inexplicable phenomena. Only Prof. Tadokoro has an idea of what’s going on: Japan – every last one of its islands – will sink into the ocean, destroyed by the same force that once has created it by splitting it off Asia. When evidence mounts that Day X is not more than two years away, there begins a frantic struggle of scientists and the government to make sure the nation of Japan and its people have some way of surviving. 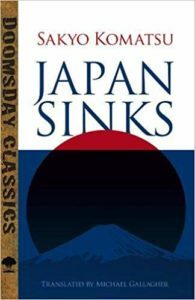 This book does not dwell on the disastrous effects of almost constant earthquakes and volcanic eruptions on the Japanese citizens, but a sense of terror and urgency is conveyed throughout. We follow a few scientists and politicians in producing evacuation plans, fully understanding that the death toll will rise to the hundreds of thousands, regardless. Another touching scene is a secret meeting with the Australian prime minister, who is presented with a priceless, 800 year old artifact while being asked to consider accepting one million Japanese refugees. “Our shrines and temples are full of such statues”, says the negotiator. Even though the book was written back in 1973, it does not show its age. Written in a realistic manner without sensationalist effects, it brings up a number of timeless, interesting questions: What is a “nation” and how important is the actual land on which it was founded? What are the indispensable parts of a culture and how many – and which – artifacts should you try to save facing certain destruction? And how many people are required in one spot to make sure said culture is not doomed altogether? Sakyo Komatsu (1931 – 2011) was a Japanese screenwriter and considered one of the Japanese masters of science fiction. Born in Osaka, he studied Italian literature at Kyoto University and worked at a number of different jobs afterwards. His career as fiction writer started in 1960, and he published Japan Sinks in 1973 after nine years of writing. The book received the Mystery Writers of Japan Award and the Seiun Award, and was subsequently turned into a movie and a television series. A wonderful and timeless book, available on amazon.